PA veterans JBL have upgraded their already successful Eon One system with an expanded mixer — and a battery powering option. The Eon name has been associated with JBL’s portable powered speaker range for some years now; I think that the first powered speakers I ever reviewed were the original grey Eons that led the ‘active 12’ market very early on and are still to be found doing sterling duty in countless clubs and theatres. Things have moved on since those early years, and the Eon line was eventually expanded to include linear array technology, with the release of the original Eon One (reviewed SOS November 2016). Line array systems have become pretty much the norm in large venues and, given JBL’s success with their high-end products such as the VTX system, it’s not surprising that they have incorporated their experience and expertise in this field into their portable Eon One range. I became acquainted with the Eon One a couple of years ago when I was invited to review it for this magazine, and despite being very impressed with the overall package concept and performance, I was of the opinion that although it was a great little product for solo and small group performers, it probably wasn’t something I myself would make much use of in my line of business. Rather, I thought it would be a useful item to have in the inventory, in case the right application came along. This has proved to be a completely wrong assumption — out of all my smaller systems that have gone out on hire, or been used for small-venue live sound jobs, the Eon One has (I have checked the records!) been used on more jobs and in more diverse live situations than any of my other small portable rigs. It’s been used for big-band vocals, live auditions and many show rehearsals, piano bar-type music, corporate presentations and even a choral flash mob at a major railway station — it’s just so incredibly easy to use, and although it doesn’t deliver pub band PA levels, it has the ability to fill any reasonable space with nice evenly balanced sound and takes literally seconds to set up. So what about the new kid on this rather interesting and fast-evolving block, the Eon One Pro? Good as it is, the original Eon One wasn’t and isn’t perfect, and there have been times when I have wished it was just that bit lighter or I could have done with a couple of extra inputs to avoid using a small mixer as well. I have never actually wished that it didn’t have to be plugged into a power socket, but battery technology is advancing rapidly and no doubt we’ll soon be irritated at the sight of anything with a mains lead... So let’s do the obvious thing and look at the main differences between the Eon One and the new Pro model. 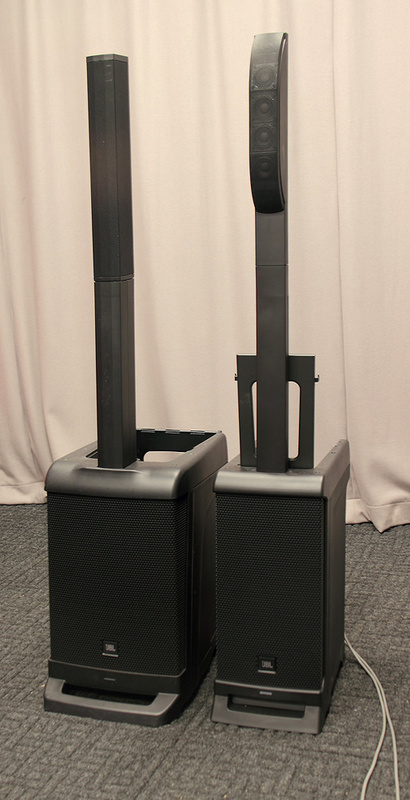 The original Eon One system (left) alongside the new Pro version (right).The first and most obvious difference is the smaller and lighter bass enclosure, and the slimmer design of the array column, which now has a lean, almost skeletal look. The two supporting sections (for height adjustment; you use as many as you need, depending what height you want the array to be) are much thinner, the top part containing the vertical D-curved 6x2-inch array itself has also been slimmed down, and the driver housing now protrudes forward of the supporting column in a sort of rounded pod. It’s an elegant-looking thing and the whole setup is nicely proportioned when assembled, whether neither, one, or both height spacers are used (depending on the application and how high the woofer section is placed, eg. on the floor, table or stage). The reduced size of the bass module is achieved partly through the use of an eight-inch driver as opposed to the Eon One’s 10-inch unit, and by some redesigning of the LF enclosure itself. The overall style has been retained from the Eon One, albeit in a narrower shape, and I’m glad that JBL have kept the rubber ‘bigfoot’ base design and large integral carrying handle on the front lower edge; carrying the Eon One Pro is an easy one-handed affair but there are times (for example when inserting it into the back of a car) when you need to lift or carry it horizontally, and this handle makes that an easy job. The most interesting factor of the bass module’s redesign is that it now incorporates a powerful lithium-ion battery that automatically charges whenever the Eon One is connected to a power source, and can deliver (according to the spec) up to six hours of use when a mains supply is not available. A charge meter shows that the battery is charging, and indicates the level of charge remaining in the battery; around five hours is required for a full ‘from nothing’ charge but in reality a part-charge would be more likely and a lot quicker, and being a lithium-ion battery there’s no problem with either recharging when it’s only partly drained, or with using the unit when it’s not fully charged. I found no difference in performance between mains and battery operation, and it will run for quite some time even with only two or three ‘battery bars’ showing. The combined weight of the new Eon One Pro, including its lithium-ion battery, is 17kg — that’s 1.5kg lighter than the Eon One, so this significant new feature has thankfully not come at the expense of increased weight. 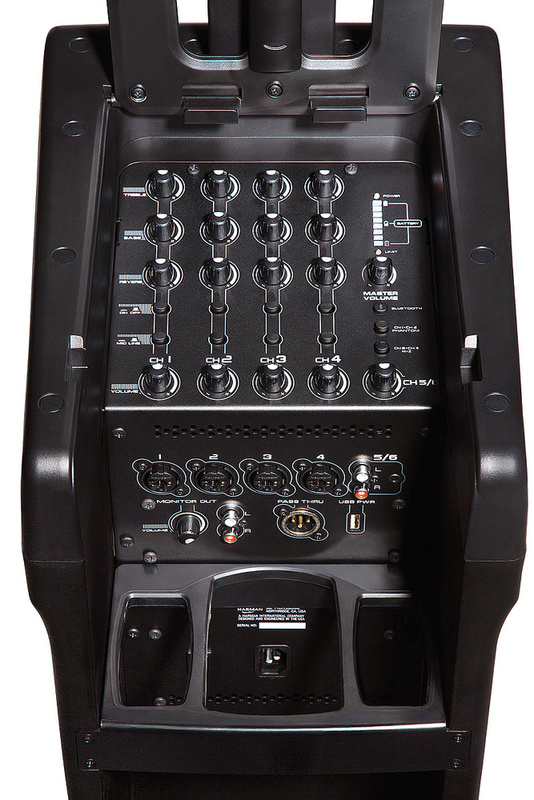 Another major upgrade is the mixer section, which benefits from additional mic input channels, switchable phantom power, and expanded output options. 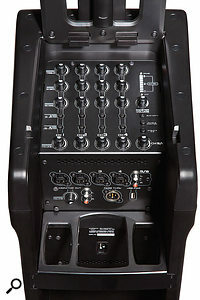 The mixer now has four mic inputs, each equipped with combi connectors that will accept either XLR or TRS plugs, and a pair of stereo inputs accessible via unbalanced RCA (phono) inputs or a stereo 3.5mm jack. A stereo monitor output with a level control is provided on unbalanced RCA connectors, and there’s a mono summed XLR pass-through output for daisy-chaining on to another Eon One Pro (or any other) system. The Eon One Pro will also receive a streamed Bluetooth signal that is sent direct (ie. you control the level on your paired device) to the amp section and monitor outputs. The Eon One Pro improves upon the original with an expanded mixer section. Here, channels 1-4 can accommodate mic or line signals, with channels 3-4 additionally capable of handling passive instruments. A stereo input is also provided, and this can be fed either via two RCA phono sockets, or a Bluetooth stream.The four main input channels each have two-band EQ, and individual reverb controls; you can’t adjust the reverb settings other than switch it out for each channel, but it does provide a decent enough effect for adding some warmth and extra body — I tried it with acoustic guitar and vocals and the results were perfectly acceptable within this context, although this would of course depend on your own preference. Inputs 1 and 2 have a switchable 48V phantom power supply, thus opening the road for using nice vocal condensers or connecting active DI boxes, and inputs 3 and 4 can be switched to ‘Hi Z’ mode for direct connection of guitars and similar pickup-type instruments; this switch converts both channels 3 and 4 from 4kΩ balanced into 40kΩ unbalanced inputs. Channels 5 and 6 operate as a stereo pair, and have only a single level control between them. This stereo input is intended for playback devices but could be used to provide additional inputs for two independent sources (the inputs are summed to the internal amp) provided that they could be externally controlled. These are useful features and increase the scope of the Eon One Pro; there are now enough inputs and input variations to accommodate most situations where you’d be using this system on its own. One thing that takes some getting used to is the apparent insensitivity of the inputs, in that the channel level controls do need to be wound up quite a way to achieve anything like full output; this is something that I’ve noticed with the original Eon One, and I found that the Pro model exaggerates this somewhat. Running a side-by-side comparison between the two models, with the master levels on 100 percent, the channel volume on the Pro needed to be set at a significantly higher point on its rotary travel to achieve the same output volume; having said that, the full output (just before limiting occurs) is achievable without a problem, and it’s worth experimenting with the relative settings between channel and master to get best results — and if you’re running the Pro right on the limit every time, perhaps it’s time to look at expanding the system anyway! The Eon One Pro delivers the same maximum output as the Eon One; the SPL figure of 118dB is exactly the same and although this isn’t anywhere near as high as most typical active 12-inch speakers (which you’d expect to be in the upper 120s), you have to look at it in the context of what this is designed to do. The HF coverage is quoted as 100x50 degrees but in practice — indoors at least — the practical coverage seems to be wider than this and the best way I can describe it is as ‘filling the space’, as line arrays are wont to do, with well-balanced, consistent output. 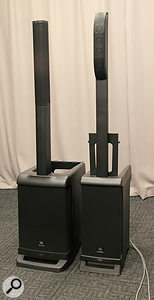 The top speakers can be raised or lowered as needed simply by using or omitting the vertical spacer poles.The inclusion of a link output on the One Pro is supported in JBL’s promotional literature by suggesting that a second unit be used to provide a stereo, one-per-side PA setup along traditional lines. This wouldn’t happen if you used the link output, though, as everything is summed to mono anyway, so you would probably just run with separate left and right feeds to each side. Where it is possible to depart from the norm, however, is with the positioning of the speakers, and it should be feasible to place a pair of Eon One Pro units behind the performers as they don’t produce feedback anywhere near as easily as traditional ‘point and shoot’ speakers (again, because they are arrays). I have often considered obtaining a second Eon One to run with mine, to see if a pair of them could approach the sort of levels necessary for a normal band-type gig with everything miked up, and although I haven’t had the opportunity to try this I might well do so before I have to return the One Pro to its owners. There’s not much more to say about the Eon One Pro, but there are a couple of nice little extra touches in the form of a built-in camera mount on top of the column, so live footage can be captured and used for promotional or blackmail purposes after the gig, and there’s even a USB charging socket on the mixer panel so that your appropriately powered devices don’t expire during a performance. I’ve used the Eon One Pro in the studio with solo and duo performers, as a vocal PA for my 16-piece band rehearsals, for a solo performance by a drummer where the Eon One Pro was providing the backing track, and tried it out a couple of times in the local church where a new system is being considered. Every test has been positive and successful, and I’ve had very encouraging comments from everyone who has used or heard this little rig — I could have sold the review unit a couple of times! It is certainly easy to carry into a venue and setup time is negligible, although to be honest I haven’t needed the battery backup other than when testing outdoors or showing interested parties what it can do. Having said that, a job has just come in where running a power cable for an outdoor service is going to be a major headache, so if I still have the review unit at that time I might just have to use it. In summary, the Eon One Pro does exactly what you’d expect it to do, and it does it very nicely indeed once you get used to the array characteristics and control settings. The overall sound is very nearly the same as the original Eon One, especially when operating at an enthusiastic volume, and if anything a bit clearer and tighter a bit further down the scale. It does have a particularly clear and airy top end that most vocalists should love. The storage arrangement for the line array and column spacer sections is much more secure and easier to negotiate on the new model. The column sections also fit together and come apart much more easily than on the Eon One, which I personally think is a big improvement. The column, when mounted to the amp section, is deeply recessed and quite secure, although it does wobble a bit if you pick up the whole (assembled) unit. However, the connectors don’t seem to mind and in any case you wouldn’t want to move it too far like this. The cover flap on the Pro version functions as an iPad rest when in the ‘up’ position, which is how I assume it’s meant to be used as you can’t really access the mixer panel with the lid down. The sound is just as good, the output power the same, but it’s easier to carry and the mixer is that bit more capable. JBL have told us that they have no plans to drop the ‘classic’ Eon One, and I expect the two models will both continue to sell well. Since they perform so similarly, I think for many purchasers the main choice will be between the convenience of battery operation and the lower price of the original version. 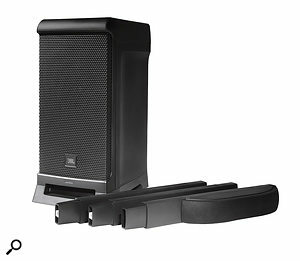 A number of portable column systems are available from manufacturers including Bose, LD Systems, K-Array, RCF and Wharfedale. Highly portable, practical and versatile one-box quality PA system. Phantom power on mic inputs, and Bluetooth capability. I’d very much like to see three-band EQ on mic channels. The original Eon One combined high audio quality and great aesthetics, was extremely convenient when rigging and operating, and has provided an ideal solution to many more requirements than I ever thought possible. The new Pro model is even easier to transport and set up, has a more accommodating mixer section, and can run on battery power when needed. It’s a logical and highly practical development of an already successful design.